We’re always incredibly sad to see our students fly the Simply Theatre nest – but at the same time incredibly proud and excited for them! Huge congratulations and good luck to both Paula at Simply Theatre Zurich and Floris at Simply Theatre Geneva who have secured places at the New York University Tisch School of the Arts. Paula recently played Sergeant Samways in Danny The Champion Of The World in Zurich and Floris played the title role in Shrek at The Casino Theatre Geneva. Paula and Floris managed to find 5 minutes to tell us about their experiences! What made you decide to apply to Tisch? PAULA: Ever since I went to NYC in grade 9 I was convinced I needed to study in New York. Now I know people say there are other schools besides NYU but NYU allows the possibility for me to study what I love and take a second Major in the College of Arts and Sciences - and it’s in Soho! So, close to Broadway and Times Square. The possibilities for auditions and castings are so much greater when you’re so close! FLORIS: I’ve loved performing ever since my first theatre experience – Tarzan at age 9. I knew it was what I wanted to pursue and I pushed as high as I could – and I’m grateful it paid off! What did you make of the audition process? PAULA: I didn’t like the fact that I had to send audition tapes because I couldn’t afford to fly over for a weekend - and, since I sent out audition tapes to 6 universities, it was also expensive. I had to make the most of sending video tapes -the stress of this, however, is - when you have a technical problem (which I did with the dance part of NYU’s application because the camera filming me ran out of film and I didn’t realise till after the second recording and you can only watch the choreography twice before the link disappears)! So I had to make do with the footage I had despite not being able to show my second attempt when I actually knew the choreography! FLORIS: The whole thing was intense! I made sure to get outside help, knowing that “practise makes permanent”, and that I only had one big shot. I told myself to have fun and to make the most of the amazing experience. 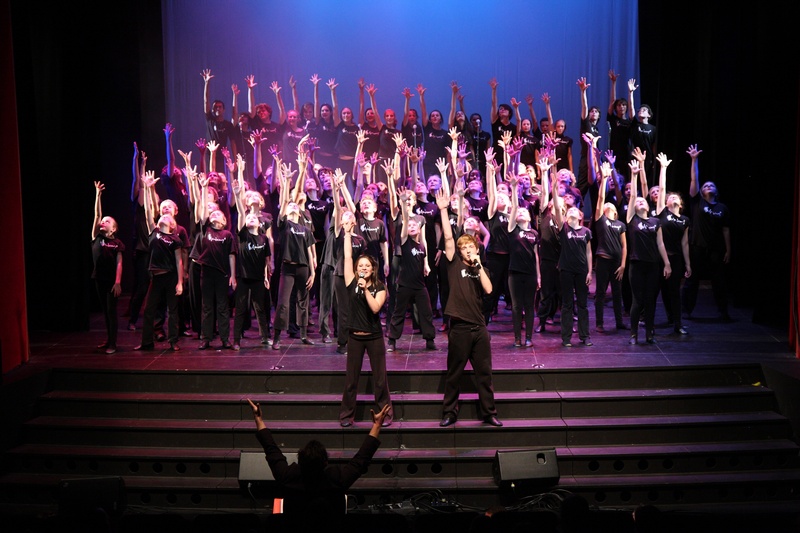 How do you feel your Simply Theatre experience has prepared you for the audition process? PAULA: Doing LAMDA in previous years helped me with learning monologues and Jo (Simply Theatre Zurich) helped me choose a monologue for my audition process. Stefanie (Simply Theatre Zurich) also helped me make a modern dance routine to send off to other universities. FLORIS: The performance experiences offered by Simply Theatre have been absolutely invaluable to me. I’ve been able to work with West End Directors (crazy!) and learn more from the incredible teachers I’ve had the past 8 years. I have been lucky enough to have Allison Bryan (Simply Theatre Geneva vocal coach) guide me every step of the way and I can truthfully say she has taught and inspired me more than anyone else on this planet. What have been some of your favourite roles at Simply Theatre? PAULA: One of my favourite roles was Hippolyta, it wasn’t a large one - but it was a fun and interesting character to play - especially my 2 minute costume change into a wedding dress and everything! Being a part of the Joseph And The Technicolor Dreamcoat cast was also a great and favourable experience as it was also my first with Simply! FLORIS: My all -time favourite was Fagin! I also loved flying in Peter Pan and sweating off my moustache as the Pirate King. Being Shrek was an unforgettable experience overall, especially the 3 hour makeup process! Now you have been through the process of “getting into drama school” what advice would you give to our younger up and coming students? PAULA: Take every upcoming opportunity - every audition, every performance opportunity, take it! Don’t let anyone bring you down, you have to believe in yourself and work hard for the impossible because it might not be impossible, it might just look that way! FLORIS: Find material that truly speaks to you – it makes all the difference. Don’t pick it only because it shows you off. Take every opportunity offered to you – be it ensemble or lead – and just have fun! PAULA: To be on Broadway, hopefully :) maybe to play Elphaba one day or Cathy in an off-Broadway production in The Last Five Years - the music from that musical is my absolute favourite! FLORIS: My dream is to one day be on Broadway and originate a role. I also hope that one day I’ll get to stand onstage again alongside some of the incredible friends I’ve made at Simply Theatre.